Kevin Rudd - Stand and Deliver! 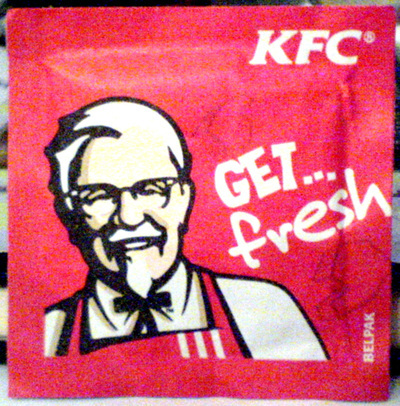 I’m not proud, and I wouldn’t normally admit to it, but I recently partook of a meal of KFC – or what used to be called ‘Kentucky Fried Chicken’ until it was re-branded either to avoid the negative connotations of fried food amongst health conscious fast food consumers (you sickos know who you are), or because the chicken is no longer fried, thus constituting a breach under the Trade Descriptions Act (a section of the Fair Trading Act, apparently). Either way, said chicken was consumed, no different to any other time the family has chosen to indulge in this sort of meal. But the previous time, for me, was quite a while ago. Years, I’m thinking. So long ago that I was unfamiliar with the current incarnation of the Colonel Sanders caricature that adorns the packaging and related paraphernalia. Oh, I assume it’s the refreshing, lemon-scented moist towelette™. But the last time I encountered one of these, it came in a rectangular white package rather than this square red one. And it had directions on the back. No longer offering directions (as if they were ever needed!) it looks like the Colonel has branched out into prophylactics – as if KFC is the meal you’d treat a date to, en route to the boudoir. And they’re doing it deliberately, since the package bears the legend “GET… fresh” – itself a ‘fresh’ (as in ‘improperly bold or forward’) play on the other f-word you could be getting, had you that other, similar-looking packet. Although, what other options did they have for a catch phrase, motto or statement? “It’s finger-licking good” and “I like it like that!” would be just too cheeky. The irony is, past experience has proven that the refreshing, lemon-scented moist towelette™ wipes up diddly squat. Open it up, and you have two more bits of rubbish to discard instead of one. Better off heading straight to the bathroom and washing your hands properly. But since we chucked our little packets without opening them, I’ll never really know if indeed it was one of those towelettes, and not some other device with which to ‘GET… fresh’. Who knows? Maybe KFC stands for the “‘Kev’s Franger’ Condom”.